Scientists say that a "Martian flower," seen here in an image from the Curiosity rover's Mars Hand Lens Imager, is a 2-millimeter-wide grain or pebble that's embedded in the surrounding rock. Another, darker-colored mineral grain can be seen above and to the left. The scientists behind NASA's $2.5 billion Curiosity rover mission on Mars on Tuesday explained the nature of a tiny, gleaming "flower" embedded in Red Planet rock, and revealed where they'll be using the SUV-sized robot's drill for the first time. Both those developments point to the same happy discovery: The place where the rover is working was almost certainly formed through the action of water — and seems likely to provide new insights into the planet's geological history. "This is something that we've waited patiently for," Caltech geologist John Grotzinger, the mission's project scientist, told journalists during a NASA teleconference. The "Martian flower" made a splash on the Internet, in part because it looked so different from the surrounding rock in a microscopic-scale picture from Curiosity's Mars Hand Lens Imager, or MAHLI. Few people thought it was actually a flower, though it looked a bit like one. Was it a piece of plastic from the rover itself? An unusual type of mineral? The Planetary Science Institute's R. Aileen Yingst, deputy principal investigator for the MAHLI team, delivered the expert verdict. It's a relatively large mineral grain, or "a pebble, if you wish," measuring about a tenth of an inch (2 millimeters) wide. "It could be a lot of things, but without some chemical information to back me up, I'd really hesitate to say what it is," she said. She pointed out that a couple of similar, darker-colored grains could be seen embedded nearby. The important thing is what such rounded grains have to say about the scene's history. "They've been knocked around, they've been busted up. They've been rounded by some process," she said. That suggests that running water helped form the rock, which has been nicknamed Gillespie Lake. Five months after its landing, the six-wheeled Curiosity rover is surrounded by plenty of additional evidence that water had a hand in shaping the landscape billions of years ago. That's why Grotzinger and his colleagues have decided to put the rover's heavy-duty drill to work for the first time on a flat spread of rock called "John Klein." The name pays tribute to John W. Klein, a former deputy project manager for the Mars Science Laboratory mission who died in 2011. 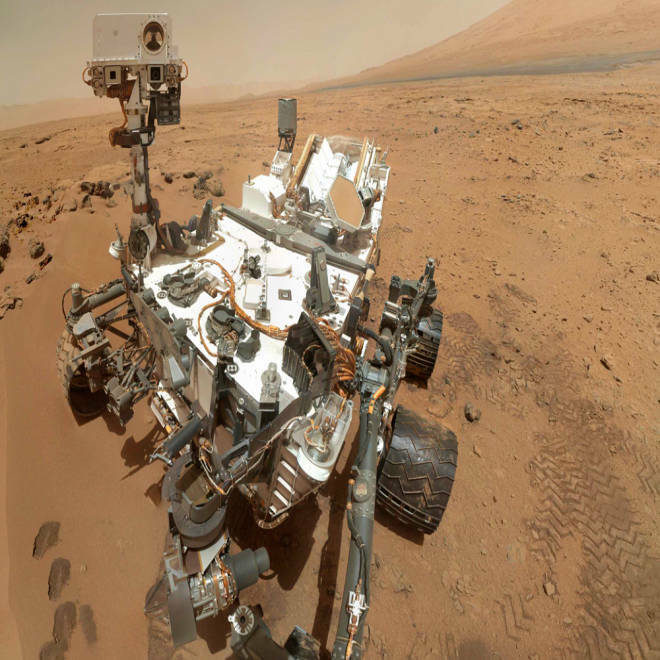 "John's leadership skill played a crucial role in making Curiosity a reality," Richard Cook, the mission's project manager, said in a news release. This image of an outcrop at the "Sheepbed" locality, taken by NASA's Curiosity Mars rover with its right MastCam on Dec. 13, show well-defined veins filled with whitish minerals, interpreted as calcium sulfate. These veins form when water circulates through fractures, depositing minerals along the sides of the fracture, to form a vein. This is Curiosity's first close look at minerals that formed within water that percolated within a subsurface environment. Cook told reporters that the first drilling operation would probably take place in the next two weeks, after additional rounds of engineering tests and scientific study. "The scientists have been let into the candy store," he said. One of the most interesting characteristics of the site is that it's shot through with light-toned veins of calcium-rich material. "On Earth, forming veins like these requires water circulating in fractures," said Nicolas Mangold of the Laboratoire de Planétologie et Géodynamique de Nantes in France. Mangold is a member of the team behind Curiosity's laser-equipped Chemistry and Camera instrument, or ChemCam. Grotzinger marveled at how different the terrain is from the spot where Curiosity landed, even though both are within Mars' 96-mile-wide (154-kilometer-wide) Gale Crater. The rover's current base of operations, nestled in a shallow depression called Yellowknife Bay, has a type of bedrock that cools more slowly each night than the surrounding terrain. "We don't know what's causing the change," Grotzinger said. "It's like we entered a whole different world," he said. The drill at the end of Curiosity's 7-foot-long (2.1-meter-long) robotic arm has not yet been used, but mission managers will command it to drill a series of holes going as deep as 2 inches (5 centimeters) into the rock. The first test holes will serve to clean off any leftover earthly contamination, Cook said. Grotzinger said the drill will eventually produce scientific samples to be fed into the rover's onboard chemical labs, known as CheMin and SAM. "What we're hoping to do is sample both the vein-filling material as well as what we call the country rock around it," he said. Before Curiosity's landing, NASA reported that small amounts of Teflon and other material from the drill might contaminate the rock samples. On Tuesday, Cook said the scientists "could work around" the contamination issue by accounting for the unwanted chemicals when they did their analysis. Curiosity's two-year-long primary mission is aimed at determining whether Mars could have had the chemical building blocks required for life as we know it. Eventually, the 1-ton rover will make its way to a 3-mile-high (5-kilometer-high) mountain in Gale Crater, but Grotzinger said scientists wanted to take ample time to investigate the mysteries they're finding along the way.